2UIQA. Instituto Superior de Agronomia, TULisbon (Portugal). 3Departamento de Química Analítica, Nutrición e Bromatoloxía, Instituto de Investigación e Análise Alimentario, Universidade de Santiago de Compostela.Santiago de Compostela,España. In this work, a revegetation experiment was performed on a forest soil artificially burnt in the laboratory, and the results of the soil without treatment were compared to those of the soil capped with an organic mulch. 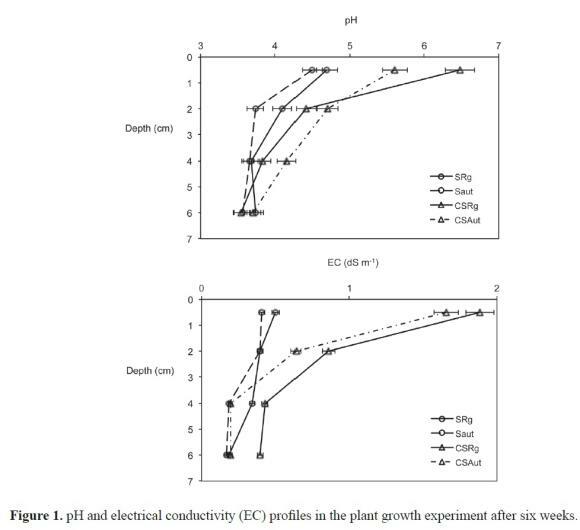 Plant biomass, as well as the variation of pH, electric conductivity (EC), and phytotoxicity with depth, were recorded. Only a very low plant growth was observed in the uncapped soil. The substrate-amended soil had a higher production than the uncapped soil, despite showing an increased EC due to the mulch. The increase of pH or salinity during burning can be discarded as the cause of the different plant growth, because the values reached were not high enough to justify the negative effect observed. The determination of phytotoxicity after burning the soil at temperatures between 100°C and 500°C suggested that the problems observed for seed germination in the burnt soil might be linked to the formation of undetermined phytotoxic substances after soil heating at a temperature near 200°C. Although polycyclic aromatic hydrocarbons followed the same trend as phytotoxicity with temperature, their concentrations in soil were too low to be the cause of the effects observed, so they can be discarded as playing an important role in phytotoxicity. Keywords: Forest fire; Burnt soils; Heat treatment; Phytotoxicity; Mulching. Forest fires have important effects on ecosystems and, in particular, on soil properties, which largely depend on the intensity and duration (severity) of the fire (Certini, 2005; Keeley, 2009). Severe fires are the cause of several negative effects on soil, including removal of organic matter, deterioration of soil structure and porosity (Díaz-Fierros et al., 1989; Jordán et al., 2011), loss of nutrients through volatilization, ash entrapment in smoke columns, leaching and erosion (Saa et al., 1994; Certini, 2005; Shakesby, 2011), and alteration of microbial and soil-dwelling invertebrate communities (Carballas et al., 1993; Vázquez et al., 1993; Certini, 2005). In order to minimize the effects caused by wildfires on soil, the ash layer needs to be stabilized, the vegetation reestablished and the soil structure improved as soon as possible after the wildfire has ended (Vázquez et al., 1996). Nevertheless, ecosystems perturbed by severe forest fires usually have a slow rate of recovery, and soil often remains bare several months after fire occurs, with the consequent risk of degradation by erosion (Neary et al., 1999). This behaviour is mainly a consequence of the loss of organic matter, the physical degradation of the soil, and the apparition of a hydrophobic layer which limits water infiltration and increases runoff and erosion (Imeson et al., 1992; DeBano, 2000; Certini, 2005). In addition to this, some authors have observed an associated apparition of toxic substances in burnt soils (Díaz-Raviña et al., 1996), which represents an additional problem for restoration, if they happen to be phytotoxic. Despite the relevance of this possibility for plant development, the phytotoxicity in burnt soils has not been widely investigated to date. In this work, two experiments have been performed in order to investigate phytotoxicity in a forest soil burnt in the laboratory. In the first experiment, plant growth and phytotoxicity were compared in the burnt soil with and without an organic mulch. In the second experiment, the evolution of phytotoxicity was studied in the soil heated at different temperatures. The soil used in the experiments was a forest soil under pine (Pinus pinaster Ait.) and acacia (Acacia melanoxylon R. Br. ), developed over granite, located on the Pedroso hill (Santiago de Compostela, Galicia, NW Spain). Six random samples of the upper 10 cm of the Ah horizon of the soil were taken in March 2009 and mixed in a composite sample. The soil was sieved to <4 mm prior to the experiments. The soil presented an acidic pH (4.2) and a high organic carbon content (100 g C kg-1), usual for forest soils of the humid temperate zones of NW Spain. Similar soils in the area are classified as Haplic Umbrisols (FAO, 2006) or Humic Dystrudepts (Soil Survey Staff, 2006). An experiment was run where the plant growth on the bare burnt soil was compared to that on the same soil covered with 2 cm of an organic mulch. This mulch was made up of a blend of municipal solid waste (MSW) compost and composted pine bark (1:1 by volume), with a commercial polyacrylamide (Alco-sorbÂ®, 1 g L-1). The mulch composition was selected on the basis of previous experiments where plant growth, water holding capacity and water repellence were evaluated in blends of MSW composts, composted pine bark, manure vermicompost, guar gum, ben-tonite and polyacrilamide (Basanta et al., 2009). Due to the relatively high cost of post-fire rehabilitation, the use of mulches composed of local materials is a priority, so both the MSW compost and the composted pine bark employed in the mulch formulation were provided by industries near to Santiago de Compostela. The main properties of the MSW compost were the following: pH 8.7; total organic matter: 380 g kg-1; EC15 5.1 dS m-1. The main properties of the composted pine bark were the following: pH 5.3; total organic matter: 914 g kg-1; EC15 0.37 dS m-1. A fraction of the soil was distributed over a 2-cm gravel bed in four 0.25-m2 PVC containers, in order to reach a 10-cm high soil layer. Another fraction of the soil was burnt in the laboratory using a set of six lamps with a total power of 3000W. The lamps were placed at a distance of 15 cm from the soil, resulting in a temperature of 300°C on the surface of the soil, and near 100°C at a depth of 2 cm. A 5-cm high layer of the burnt soil was placed over the unburnt soil in the four containers. This experimental disposition allowed for a good reproduction of a real forest soil affected by a fire of moderate intensity, where temperatures around 300-400°C are reached at the surface, and soil below five centimetres is not usually affected by the fire (Carballas, 2003). Next, a 2-cm layer of the organic mulch was placed in two of the containers, whereas in the other two the soil remained bare. Two blends of seeds were employed for the revegetation experiment, each one in two of the containers, as summarized in Table 1. A mixture of Lolium perenne (ryegrass) and Lotus corniculatus (birds' foot trefoil) was employed for the treatments SRg (with bare burnt soil) and CSRg (with capped burnt soil). Also, a commercial revegetation seed blend (Semillas Zulueta, S.A.) containing autochthonous graminae and shrubs (composition shown in Table 2) was used for the treatments SAut (with bare burnt soil) and CSAut (with capped burnt soil). In all cases, the blends were used at a rate of 2 seeds per cm2. Two seed blends were employed in order to assess potential differences in plant growth as a consequence of the species composition. Seeds were randomly distributed by hand and buried a few millimetres into the surface. The four containers were then placed outside in an area protected from the rain, in May 2009, and watered daily (about one litre of water for each container) for the next sixteen weeks. where G and L are the germination and root growth of the samples, respectively, and GC and LC the germination and root growth of the control (distilled water), respectively. Another fraction of the soil was oven-heated for six hours at five different temperatures: 100, 200, 300, 400 and 500°C. The following determinations were run for each treatment: total organic matter by loss on ignition at 550°C, pH in 1:2.5 water suspension, electrical conductivity in 1:5 extract, water repel-lence, phytotoxicity in 1:5 aqueous extracts and by a direct growth test, and polycyclic aromatic hydrocarbons. The phytotoxicity of the aqueous extract was determined as explained above. For the direct growth phytotoxicity test, three Petri dishes each containing 15 g of soil and 15 garden cress seeds, previously soaked in water, were prepared for each soil. The Petri dishes were incubated in the dark at 25°C for five days, and then the germination was quantified and the root elongation measured (Mos-coso et al., 2007). The germination index (GI) in this test was calculated as explained above, with the difference that here GC and LC are the germination and root growth of the non heated soil, respectively. The water repellence was evaluated by the Molarity of Ethanol Droplet (MED) test as described by King (1981) and Roy and McGill (2002). As several authors have indicated the apparition of aromatic compounds in soil during forest fires (García-Falcón et al., 2006), the presence of polycyclic aromatic hydrocarbons (PAHs) was also determined, in order to test if they may be responsible for phytotoxicity. These were extracted using a solid-phase dispersion procedure, and determined by high performance liquid chromatography (HPLC) with fluorescence detection, following the method described by Pena et al. (2007). 3.1. Plant growth experiment The utilization of the organic mulch had a very favourable effect on seed germination and plant growth in the burnt soil (Table 3). It is noteworthy that after four months, no significant plant growth was observed in the burnt soil without treatment. The plants that germinated in the uncapped soil treatments (SRg and SAut) were Acacia seedlings, whose seeds were present in the forest soil and germinated below the burnt soil. 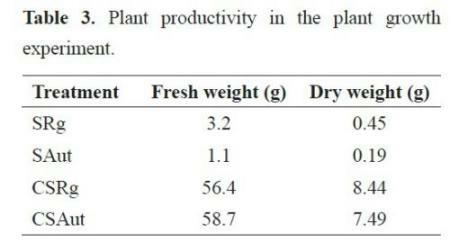 Nevertheless, the treatment with the mulch produced better results of biomass production (Table 3). It has to be noted that the autochthonous shrubs included in the commercial blends did not germinate in any treatment. Although the effects of mulching on vegetation recovery after fire are not widely known, other researchers have also observed that mulching improved the germination of seeded grasses (Robi-chaud et al, 2000; Carballas et al, 2009a). Mulches are commonly applied in post-fire rehabilitation to reduce the effects of rain impact and overland flow, and to keep the soil in place, as they are especially effective in increasing ground cover during the first post-fire year, when erosion is likely to be the greatest (Bautista et al., 2009). Organic matter acts by providing a suitable physical medium for seed germination, as well as preventing desiccation due to its high water holding capacity, and several studies have proved that the addition of organic wastes increases the plant cover in burnt soils, with the consequent reduction of the risk of soil erosion (Villar et al., 1998; Guerrero et al., 2000; Guerrero et al. 2001; LarchÃ¨veque et al., 2005). For example, Bautista et al. (2009) found that seeding without mulching did not increase ground cover in burnt soil, while the mulch combined with seeding produced the highest plant cover values, as a result of the increment in soil moisture content and by holding the seeds in place in the soil. The severe difficulties found for seed germination in the burnt soil without mulching could be attributed to excessive salinity or extreme pH, common features of burnt soils as reported by other authors (Giovannini, 1994; Ulery et al, 1995; Carballas et al, 2009b). However, analysis of the soil profiles taken after six weeks allowed this hypothesis to be discarded. Figure 1 shows the pH profiles, with their natural acid values in the deepest sections (corresponding to the unburnt soil), and higher values in the upper section of the profiles (corresponding to the layer of burnt soil and the organic mulch). Burning increased the pH of the soil by approximately one unit, as shown by the differences found between the surface and the deeper sections in the profiles of the non-capped soils (SRg, SAut). It must be noted that this pH increment for the burnt soil is moderate, as a consequence of the high buffering capacity of the soil, common in Galician forest soils due to high acidity and organic matter content (Carballas et al., 2009b). The highest pH values were found in the surface section of the capped soils (CSRG, CSAut), as a consequence of the alkaline pH of the MSW compost used in the mulch. The electrical conductivity (EC) of the profiles showed a similar trend to pH after six weeks (Figure 1). In all cases, EC decreased with depth, but the range of variation was wider in the capped soil, which presented the highest surface EC values, as a consequence of the high salinity of MSW compost. In any case, the values were not so high as to affect plant growth -for example, values over 2 dS m-1 are usually considered as limiting for compost use (Masaguer and Benito, 2008)-, so salinity was discarded as the cause of the low plant cover observed in the burnt soil. Indeed, the capped soil showed higher salinity than the uncapped soil, and even so, plant growth was not inhibited. Despite the intensive watering, the pH profiles taken after sixteen weeks (Figure 2) were overall similar to those sampled previously. The soil without mulch presented a very acidic pH (under 4), with little variation throughout the profile, although the values were lower than those found after six weeks. This could be attributed to the leaching of cations from the surface, which was initially less acidic. For the same reason, the deepest sections of the profile of the capped soils also presented a slightly higher pH. The profiles of the capped soil also showed lower EC values compared to the previous profiles, especially in the upper section, which is again a consequence of leaching. The profiles of the soil without mulching were similar to those observed after six weeks of experiment. The data obtained from the two sampling times agree in that excessive pH or salinity cannot be the cause of the reduced plant development in the burnt uncapped soil. Therefore, other factors were also considered. One hypothesis would be the presence of phytotoxic compounds produced during the burning of the soil, which has already been observed by other researchers (Rovira and Bowen, 1966; Raison, 1979). For example, Díaz-Raviña et al. (1996) observed the toxic effects of aqueous extracts of burnt soils on bacteria, which they attributed to unidentified hydrosoluble compounds. In that case, a phytotoxic response would be detected in water extracts of the burnt soil. 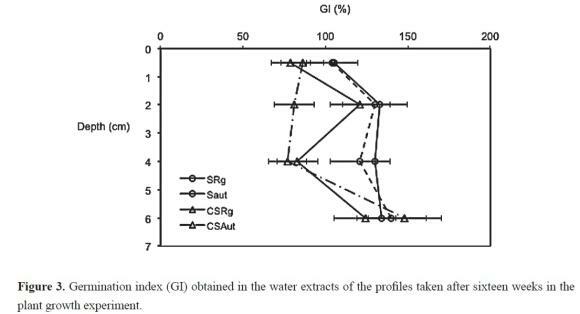 However, the germination test run with aqueous extracts of the soil profiles showed no phytotoxicity in any of the samples (Figure 3), which would be indicated by GI values under 80%. These results suggest that phytotoxic water-soluble compounds are not the cause of the reduced plant growth observed in the burnt soil. For a deeper investigation into the presence of phyto-toxic substances in burnt soil, the effect of heating on some soil properties was also studied. Increasing the temperature of soil heating produced a parallel increment in soil pH and EC (Table 4), in agreement with what has been observed by other authors (Soto and Díaz-Fierros, 1993; Iglesias et al., 1997; Quintana et al., 2007; úbeda et al, 2009). Both effects are commonly observed in burnt soils, and they are due to the denaturalization of organic acids and to the release of cations from burnt organic matter, respectively (Certini, 2005). 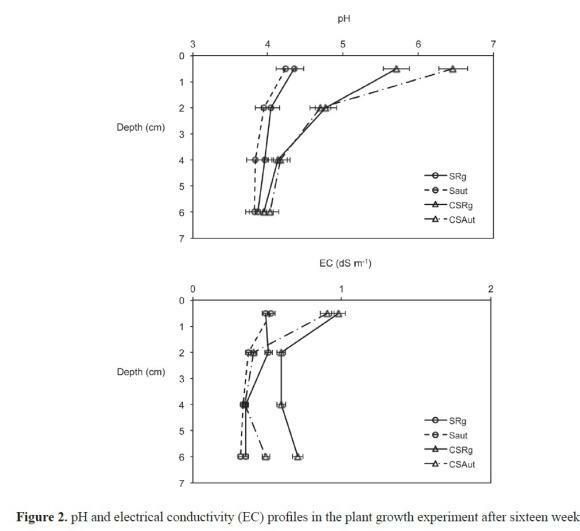 In the soil employed here, the pH and electrical conductivity did not reach extreme values which could be prejudicial for plant development, although in other soils fire has been observed to increase pH up to values over 10 and EC over 8 dS m-1, especially when temperature rises above 400°C (Ulery et al., 1993; Quintana et al., 2007; úbeda et al., 2009). Soil heating also led to a progressive decline in organic matter content (Table 4), in good agreement to what was expected, as the literature has established that soil organic matter loss begins around a temperature of 200-250°C, ending at about 460°C (Giovannini et al, 1988). The development of a hydrophobic layer may have played an important role in the difficulties observed for plant development, as well as phytotoxicity, and both processes could in fact be closely related. For example, Varela et al. (2005) observed that the water repellence of burnt soils increases gradually with temperature, reaching a peak at temperatures between 220-240°C, and disappears above 260-280°C. Here, water repellence was already severe for the unheated soil (Table 4), as is common in Galician forest soils, which have been repeatedly burnt in the past, and it remained almost constant during heating, disappearing at a temperatures higher than 300°C, as a consequence of the loss of organic matter. Therefore, although the development of an hydrophobic layer is common in burnt soils, in this case it cannot account for the low productivity of the burnt soil. As for phytotoxicity, the germination test with aqueous extracts indicated that the soil was already phytotoxic before burning, and that only after the heating temperature surpassed 300°C, was phytotoxicity reduced. Unfortunately, the high variability of the test did not allow for a better discrimination of the results at different temperatures. Nevertheless, as heating did not increase the phytotoxicity of the water extracts, the role of water-soluble compounds formed during burning was discarded, confirming the results found in the previous experiment. However, some authors have indicated that germination tests using water extracts may give an underestimation of potential toxicity when compared to tests based on direct contact with the soil (Gyuricza et al., 2010). The direct growth test (Table 4) showed that soil heating at any temperature above 100°C increased its phytotoxicity, and pointed to the highest presence of phytotoxic substances at about 200°C, as the soil heated at that temperature showed a virtual absence of seed germination and development. Since the same was not observed in the germination test with extracts, this points to the presence of non-hydrosoluble phytotoxic compounds in the heated soil. The fact that phytotoxicity appears at some point between 100 and 200°C, and disappears at higher temperatures, could point to low weight hydrocarbons such as benzene or anthracene as the cause of phytotoxicity. It is known that these kinds of compounds are produced in soil during forest fires (García-Falcón et al., 2006; Vergnoux et al, 2011). Henner et al. (1999) attributed the phytotoxicity of hydrocarbon contaminated soils to compounds such as benzene, xylene, toluene and anthracene, and observed that the phytotoxicity of aromatic compounds decreases as their molecular weight increases. Therefore, phytotoxicity could be a consequence of the formation of aromatic compounds as soil organic matter is heated. 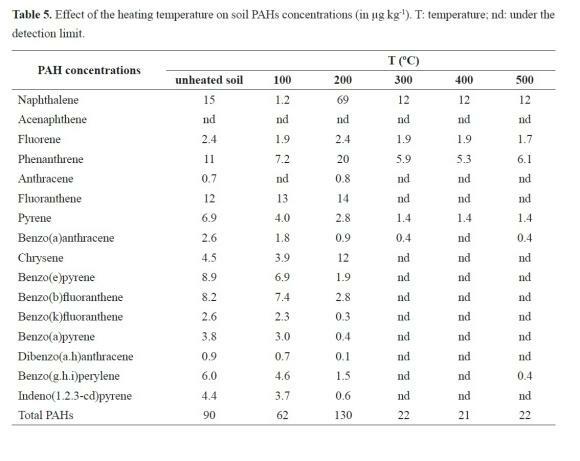 However, this hypothesis should be discarded on the basis of the results of the analysis of PAHs in the soil heated at different temperatures (Table 5). Although a peak in their concentration was observed in the soil heated at 200°C, in coincidence with the peak for phytotoxicity, the concentrations found were too low (under 1 mg kg-1 in all cases) to be the cause of phytotoxicity, since phytotoxic effects of PAHs have only been reported in soil concentrations ranging from 25 to >100 mg kg-1 (Efroymson et al., 1997). Besides, the PAHs concentrations found here are similar to values found by other authors in woodland burnt soils in Spain (García-Falcón et al., 2006), so it cannot be said that PAHs are produced during a fire episode in concentrations high enough to produce phytotoxicity. Research on the phytotoxic properties of burnt soils is still scarce. On the basis of the results obtained here, which allowed us to discard salinity, pH or PAHs as dominant phytotoxic factors in burnt soils, we think that the difficulties observed for plant growth could be due to a combination of the negative conditions created by the hydrophobicity of the soil and the presence of undetermined phytotoxic substances. The attribution of the phytotoxicity to allelopathic substances derived from plant litter, which have been found for example in eucalyptus plantations (Molina et al., 1991), is a hypothesis of considerable interest which should be further investigated in the future. In this work it was observed that plant establishment failed when seeds were placed directly in the surface of a soil burnt in the laboratory. The application of a mulch composed by a mixture of municipal solid waste compost, composted pine bark and a commercial polyacrylamide, allowed plants to germinate and establish in the burnt soil. When the difficulties found for seed germination were further assessed, it was observed that the values of pH and salinity reached during burning, as well as the concentrations of polycyclic aromatic hydrocarbons, were not high enough to justify the negative effect observed. Studying the phytotoxicity of the soil heated at different temperatures between 100 and 500°C showed the apparition of phytotoxic substances at around 200°C, which could contribute to the lack of seed germination in the burnt soil, but whose nature remains undetermined.